Regrowth from the Sylvaneth spell lore heals D6 to Sylvaneth or D3 to non Sylvaneth. So that works on allies I guess? EDIT - on topic I reckon the new rumour pic is one of the endless spells from Forbidden Power. Agreed, but 4++ was only for 20+ guys, so now the pressure to take max size units is reduced. EDIT - Ninja'd! I've tried it with 10 Evocators instead of the Sequitors too. Bit hittier and another wizard for battleplans where that matters for scoring, but I think the bigger blob of sequitors is better most of the time. I've also got a version with neither and just pump up one of the Liberator units to 30, which loses a drop, but it takes the list to 1970 so it loses out on an essential command point, so I've pretty much discarded it. 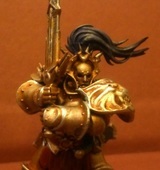 BTW, the Judicator squads are equipped that way purely because it's the models I currently have. When I'm able to get some more, I'd like both squads to be crossbows with a shockbolt prime. For the first list wouldn't a Lord Arcanum on Gryph Charger rather than on foot perfectly fill that 60 pt gap, and match the look of the rest of your army? As they're a soul wars model you can pick them up cheap too. Idoneth endless spell - Teclis's Bendy Snorkel. 2 Wizards - I've got the Evocators as well! I was at ToS too, and also managed 3-2. Must have been nicer than you though as I got 2 fave game votes I was expecting... fluffier lists than the GT so I took some Vanguard, but soon wished I'd brought my GT list! It's a lot like a list I've been working on recently - With mine I've tried to keep a castellant and staunch in there to bolster the inevitable counter attack that'll be coming their way. Also I went Mindlock Staff as the artefact to shut down Nagash, as I seem to fight him a lot! Skinks are there as an objective grabber. Could go Aetherwings and save 10 points, but the skinks I think are a bit better. I could go either way on 4 Ballista's or the Comet. Or even 3 Ballista's, no skinks and an Incantor, so I have another scoring unit in Places of Arcane Power (3 Places of Power? the one where wizards score). Lastly, I may swap out the Sequitors for 2x Liberators and 1x Judicators. Tomb King beard. Attached to an Idoneth endless spell. You heard it here first. Click the "reveal hidden content" tags! While gold may not have any intrinsic value it'll also probably be the basis of any monetary systems in the realms, because a) it'll help with verisimilitude and b) because no one wants to carry two goats for a night out in the tavern. Imagine how messy change would be!